This is a difficult column to write, and yet it's an easy one. I'm sad that today is the last day for DCI's Web content manager (the first one DCI has had) of the last four years, Dave Wilson. And yet I'm happy for Dave because he's moving on to a great job with some of the benefits he most desires in a job. One benefit is that in his new job, he doesn't have to drive to work. Despite owning a Volvo, Dave has this quirk about being impacted (not the word I'm really looking for) by all the accidents he's come treacherously close to being in (two) on his long daily commute to the DCI office. This new job in Chicago will allow him to take the train all the way in from his hometown. The second benefit of his new job is that he'll be able to be home with his family all summer long. Dave is a poster child for the concept of family man, and with three small ones in the house (including infant twin boys), being away from home much of the summer was quite a difficult pressure on him. Dave came to DCI as a total outsider, but from the beginning, he had ideas about what to do with DCI.org, ultimately transforming it from a place where people went just to buy hats and shirts and making it into the active information site it is today, full of daily photographs, news releases, feature stories, and of course, the weekly column "Fanfare." "Fanfare" was Dave's idea. I remember him calling me and saying he wanted me to provide a weekly column for the Web site. And since Aug. 30 of 2002, I've been blessed to share with the readers of DCI.org a vast weekly schizophrenic collection of incredible contributions from people from all areas of drum corps. I say "schizophrenic" because I never know where the column is going from week to week. Dave also got me involved in a huge assortment of interviews and reflections during the summer, helping, I think, to assure my continued involvement with DCI many years into the future. Ricky Fritzsching is DCI's senior Web developer. He often kidded Dave about not being "a man of the cloth" because of Dave's lack of a previous involvement with drum corps. Dave worked hard to learn what we were all about. Soon after he arrived at the office, I got a call from him asking me to "explain" Bridgemen. (Is that even possible? I told him that Bridgemen was a "state of mind.") It turned out he was going to be watching old Bridgemen performances in the staff break room during his lunch period and that he often spent lunch doing the same thing with other corps staff members had mentioned to him. He wanted to learn about our history and try to understand what made drum corps drum corps. I was deeply impressed with that. Dave's passion for his job was caught in one of the photographs that I personally cherish, taken at the edge of the field just under the overhang of the stands at Northern Illinois University's Huskie Stadium in DeKalb, Ill. 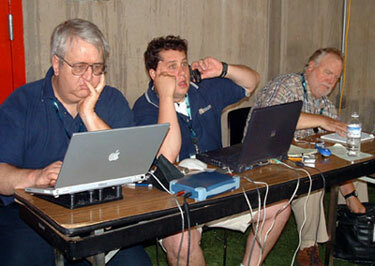 The attached photo shows Dave in the middle, talking on the phone with one of his usual serious work expressions. I'm to his right, pondering what to write next and DCI tabulator Tom Kosin is to his left. I refer to this as the "Hear no evil, see no evil, speak no evil" photograph due to everyone's expressions and gestures. So, Dave, I'll miss you sorely, but I'm excited for your future and for all the new things you'll be doing. Let me share with you some reactions from others with whom you have closely worked. Chris Weber and Missy Berg both work now in the DCI office, but they first came to DCI as summer interns a couple years ago under Dave's tutelage. Chris is now DCI's promotions project manager. "As an intern with DCI in 2004, I had the pleasure of working with Dave as I made a transition from corps member in 2003 to the business end of Drum Corps International. He taught me the finer points of interviewing and writing about the drum corps public, and we quickly bonded, sharing a similar sarcastic sense of humor. Since then, we've shared many instances of what Dave would call 'jackassery,' best described as a noun expressing witty and playful banter or situations. "I've learned a lot from Dave from the time I was interning to the time I was hired on full time at DCI. He's been a great colleague and friend, and I wish him continued health and success with his family and in his career." Missy is now DCI's Event Operations Manager. "I interned at DCI in the summer of 2003. I had just graduated from the journalism school at Iowa State University and to be working with Wilson -— someone who worked for the Chicago Tribune and now writes for Drum Corps International -— I was in heaven! He was my hero! And he has been making corps members feel like rock stars ever since. "He has touched so many lives within the drum corps community. There are countless marching members that have longed to have their photo, their comment or even their column posted on the famous site and he has made that happen. It's a big deal in this crazy world of ours! I love to see the stars in the members' eyes as they are being interviewed after a performance by Wilson or a member of the DCI.org crew. You would think they were on the red carpet in Hollywood! Wilson has been a key component of this excitement over the last three and a half years! "Every class of interns that has come through this office has had the joy of working closely with Wilson. They get to 'yellow bag it' on their many trips to 'Worst Buy' to purchase more summer technology toys. They learn to love the word 'UNACCEPTABLE!' and the phrases 'OH, COME ON!!' They learn how to make every performance from any corps at any event into a feature story and they thrive to take the same journalistic views on every aspect of our activity. And, they learn that they can always turn to Wilson for anything—especially if they just need a good laugh on a tired Monday afternoon. "Dave Wilson has always put his family first and constantly strives to be the perfect husband and father. Best of luck in the future, Wilson, and enjoy your first stress-free Father's Day (and summer!) with your family!" As all know, Dan Acheson is DCI's executive director and is responsible for having brought Dave to DCI four years ago. "When I interviewed Dave almost four years ago, I knew he would bring the level of professionalism we were seeking for the day-to-day content on DCI.org. With his journalism background and fresh from the Chicago Tribune, I was quite comfortable with his ability to find out what he needed to know about drum corps in order to report to the masses. "Dave may not admit it, but he is a big fan of the characters that make the activity successful. His ability to engage the variety of personalities and present them on DCI.org as quickly as he did can indeed be considered one of his biggest accomplishments. "Dave has been a key part in the success of DCI.org. I am sure we will not be able to replace Dave Wilson. It has been a pleasure to have as a part of the DCI staff effort his wit, personality and drive for making DCI.org a professional site. I know he will be checking DCI.org regularly as he pursues his new career direction and I am certain he will remain friends with many of those he met here at Drum Corps International. My very best to Dave as he places deeper roots in the Chicago community and continues to look after his terrific young family." I was informed that Dave and the Cadets' executive director George Hopkins were particularly close, so I asked George to provide some thoughts on Dave's tenure. "Dave is one of the great guys in the activity. He may have come from outside, but his understanding of the world, his love and admiration for the kids and his professionalism made him a joy to work with! "I always enjoyed seeing Dave at a show. We would give each other a hard time...he would make jokes about The Cadets, or me—and well—it was fun to be around him. If I remember the first time I met him. He came up to me at a DCI reception and, with some level of admiration and intrigue, asked me if I was 'George Hopkins, the guy everyone hated.' Obviously, it got a laugh from me. "I will miss Dave. We all will. He is a pro. Good luck, Dave, to you and your ever-expanding family! Now, for the love of God, slow down with the babies." In closing, Ricky Fritzsching has some personal thoughts to share. As DCI's senior Web developer, he worked side-by-side with Dave during the summer shows and was in constant contact with him all year long. "Throughout Dave's tenure at DCI, I used to always joke about him not being a 'man of the cloth' per se. You see, Dave played a mean slide trombone in his days at Plainfield (Ill.) High School, but never tried to make the slide-to-valve transition to becoming a member of a drum corps. "Dave, the next couple of paragraphs will only make sense to you." "LISTEN, go hop into your vintage Mercedes and enjoy driving to work, becoming a Web producer. You know that everyone wants to become one. Occasionally have a 'grabber' for us and don't forget that the district attorney and system administrator in your new job will never compare to what you had here. Remember, knuckle balls are still the best pitch in baseball and the eight ball is never a good thing to play with. "Please do not ever forget about the friends you made on the SUMMER MUSIC GAMES tour and the great expense seminars you have given us down the line. Huck and the gophers in Allentown will miss you dearly! Maybe after you get settled we can head out to Los Angeles, visit Crustaceans and go see the Hollywood sign. "If there is only one thing that you remember while working with me, be sure to carry a piece of CAT-5 in your bag at all times! "Thanks for the ride, man."